You save $1.95 Over 25% saving! The T-Pro MG90S is an upgrade of the T-Pro SG90. Better outputs with more torque and speed than the SG90 and also has metal gears, thus no stripping in crashes! Great reputation for reliability and inexpensive price. Can't beat it for the money. The MG90S is great for 200-450 size rc helicopter and light weight rc airplane. "3" "KpilotRCHelis (youtube)" "August 8, 2013" "I have had about 4 of these. They all worked fine, but I have noticed two things about them: 1. Slop in gear train 2. the screws holding the servos together strips out without me touching it, causing the servo to fall apart. I have to CAREFULLY CA them together. Other than that, they work fine. I used them on a giant 60" Foamy Yak on the Ailerons and they worked fine. A little low on torque, I can move the servo arm by hand easily, but all-in-all a good servo." "5" "Rick" "April 9, 2012" "These Servos are great, I have not had one failure in about 1 & 1/2 years of using these. I have these on everything from Foamies to 47" Balsa planes. Great servo at an awesome price." "5" "JimC" "April 2, 2012" "BEST SERVO EVER!!!!!!!!!!!!!" "5" "Robert" "February 2, 2012" "I ordered 10 because of the great price but not sure when i will ever use them all since I cant seem to brake any of them so i now have 6 pairs I guess I will have to build more planes to put them in and dont worry about keeping pairs in stock.." "5" "A" "February 2, 2012" "tryed these out on a small heli, worked very nice , wish they were in stock more often than they are. did end up putting them in a trex 450 pro and expect they will be great on cyclic . really a great deal. next time will order extras to have some on hand." "5" "Lloyd" "January 27, 2012" "Ordered 4 & all working great, very good for the price. can't beat them." "5" "Mike Halling" "January 25, 2012" "These work great! They are very strong and relatively quick, its very nice not worrying about whether or not your servos have stripped out in a crash." "5" "Melvin Davis" "January 7, 2012" "Really enjoyed these servos, center good use them in my foam f22 jets and just replaced all my servos in EXceed Blueray 450 . Flew heli flying good a little more trim and it's ready." "5" "Chris Khosravi" "January 2, 2012" "Replaced all my Hitec HS-65 HBs with these servos and they are awesome! They are just as good, if not, better. 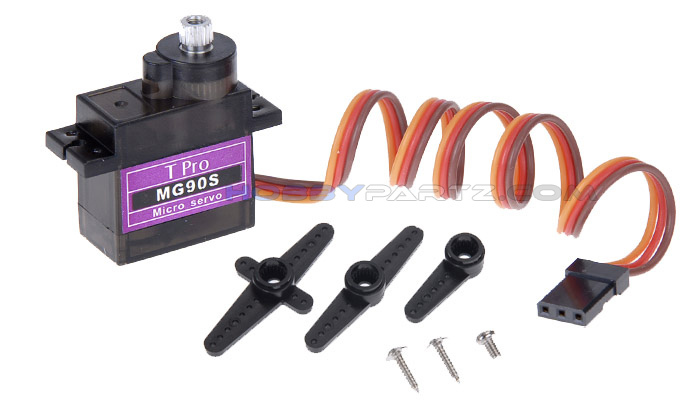 Has the same amount of torque that the HS-65 servos put out except these are so much cheaper! I will be buying more." "5" "Bill" "January 2, 2012" "I ordered four of these for a 3d parkflyer and they work great. Plenty of torque and speed. Shipping was crazy fast. In fact I received the order before I had tracking info." "5" "byrne1157" "December 30, 2011" "Excellent servos, excellent price! Got them in the holiday sales, will buy more at that price!!!" "5" "Marc" "December 20, 2011" "Got this servo from HobbyPartz and it was defective. Called them and they promptly sent me a replacement servo. This left a really good impression on me as most online sites are hit-an-miss. This servo is tough and responsive as I use it for the steering on my 1/18th scale SKDFz 250 German halftrack with no issues. Way to go HobbyPartz! I will definately buy from you guys again." "5" "slow stick" "December 19, 2011" "The servo is working fine only time will tell on the quality of its inner working.But at $6, yes I will buy many more if they keep up the go performance.Also I hear they already have a good track record." "5" "KD" "December 17, 2011" "This product was shipped and arrived on time. All the 6 servos I ordered were working correctly and resisted several crashes of a prototype glider aircraft." "5" "Josef" "December 9, 2011" "Too good to be true. Never breaks as long as you don't over voltage it and works fantastic." "5" "henry duggins" "December 8, 2011" "good servo for money" "5" "Hawker" "December 7, 2011" "Have quite a few of these in use now on larger glow and gas aircraft. They work just fine and I've yet to find one malfunction. I'm buying more of them." "5" "Steve" "December 6, 2011" "Best price on the web" "5" "Eggman dave" "November 30, 2011" "Looks great. Will most likley use on new E-Razor 450 chopper instead of OEM servo." "5" "tom coruzzi" "November 29, 2011" "great little servo.... great price" "5" "W5BSA" "November 26, 2011" "For $1 more, these servos are superior and offer improved longevity as compared to the T-Pro MG90 when used in a Trex-450. Even though they are analog they are tough and quick enough for moderate stunt flying even on the tail rotor." "5" "Robert Kozakowski" "November 22, 2011" "The servo is working fine, am thinking about purchasing more for my other planes." "5" "John Miller" "November 15, 2011" "Use these servos in my 450 Heli. Very satisfied with performance and durability. Right price on shipping." "5" "Richard" "November 12, 2011" "Great little servo for the price, I will buy more as needed. Great in my E-Jets." "5" "Dr. D" "October 27, 2011" "I have been using these Servos in ALL of my planes for over 2 years now. They have never failed. They have Ball Bearing support, and center very well. Don't waste you money on Hitec servos. Try them, and you will happy." "4" "John" "October 17, 2011" "very good servo performs well and stands up to crashes need better centered arms with it" "4" "Lucky" "October 17, 2011" "I bought these to replace the plastic geared servos on a clone 450 helicopter I recently purchased. They are quite sturdy and incridibly fast response for the price. Excellent choise for beginner flight enthusiasts." "5" "Toolman" "October 14, 2011" "Great all metal gear servo. I have never stripped one of these out yet. Well worth the bargain price. Just about every order I pick up some more just to have around just in case. Great for flaps also..... just reverse the outer pot wires and reverse the motor wire and you have a reversed servo which you will need one for the flaps. Sure beats spending 20 bucks on a serve reverser." "5" "Donald Epler" "October 10, 2011" "They flew today and were great." "5" "Jets18" "October 1, 2011" "I have installed this servo in a dozen planes and have never had a failure. The servo is great for 3d, Pattern or sport flyers." "5" "Bill" "September 28, 2011" "Need to part out servo, I keep misplacing the horn screws. Great servos, never had a problem with any T-Pro servo, use them in all my planes." "5" "christian" "September 28, 2011" "this servo is freaking awsome the price is great and there are strong i put these in my jet and my multiplex funcub" "5" "digitalleach" "September 27, 2011" "i am now swapping out all of my servos for these." "5" "Truman III" "September 24, 2011" "Put these in an RCFactory SBach 39" foamie from TwistedHobbys.com and they work flawlessly. Inexpensive yet solid performance. Plenty fast for aerobatic sport planes or 3D foamies. Would buy again." "5" "Tom" "September 21, 2011" "these servos are pretty good, however ... i used them in my walkera uflys, which has a 3 axis gyro.... these servos added a bit of weight and i had to turn down the gyros to 40% to keep the servos from twitching. i had to bend the servo links because the servo arm is thicker plastic than the stock servo arms. but other than that.. they seem to be working just fine." "5" "45heliman" "September 14, 2011" "the t pro mg90s servo are very good servos they respone really good in fligth" "5" "Scoob" "September 13, 2011" "very good quality servo simply can't beat the price" "5" "Tim" "August 24, 2011" "These are just what I needed for HL Voodoo that does 120mph. They work great and are very light. Great price!!" "5" "Jerry Stamps" "August 19, 2011" "This servo has to be one of the best values in the micro servo line. I highly recommend it" "5" "Ayl" "July 31, 2011" "I've been a RC Enthusiast for more than 25 years and I can say this without reservations, these are the best little servos for the low price that you can buy. I'm recommending Hobby Partz to all of my friends and associates who are RC hobby enthusiasts." "5" "Dave" "July 25, 2011" "These servos are great cyclic servos. Metal geared and smooth, no whine like the plastic blue servos. Worth the extra little bit of $$." "5" "Rev. Kenneth S Babcock" "July 22, 2011" "Fabulous!!" "5" "U1 racing" "July 21, 2011" "great little servo, have had mine wet in a boat and it it still working flawlessly, and there was no condensate in the case so it is fairly waterproof as far as i can tall!! A+" "5" "Steven M" "July 20, 2011" "I fly a lot of gliders with elevon and or flaperons. During combat, or just rough landings, the SG servos can become "toothless" and need work. With the MG90 S I haven't had that problem. They are pretty fast and responsive while maintaining a small footprint/profile for wing mounting." "5" "Jim" "June 24, 2011" "Best servos going! I have been replacing ALL the servos in all my foamy aircraft with this unit. It has saved at least two aircraft from crashing since I no longer have servos with internal stripped gears." "5" "info@yourhomefindernetwork.com" "June 12, 2011" "Great product superior price!" "5" "Seiko Tokuda" "June 4, 2011" "great little servo for the money" "5" "Colen Casey" "June 3, 2011" "With the specs on this servo it was a simple choice for me on what servo to use in my 450 build. Metal gears and .08 speed at 6v, you cant go wrong. These are even fast than my hitec hs-65mg servos I paid 27.00 each for. These are about to become my servo of choice for all my 450 builds. I dont think I can find a better spec servo for a better price anywhere" "5" "madmorgan" "May 31, 2011" "these babies rock ALL METAL not like some of the others that claim to be metals. have em in the blade 400 and the exi 450, oh yeah and in the mini exi 250 cant go wrong." "5" "fixitman" "May 25, 2011" "Work great, can't beat the price!" "5" "wingman800" "May 22, 2011" "I bought 4 of these I was wondering they move backwards from my original what is the easyest way to turn them the other direction? I tryed turning the plug but it seems the wires will have to be changed in the plug. I didn't know there are differant rotations for these servos. they seem to be good but I have to have the rotation changed" "5" "Mitchell Miller" "May 15, 2011" "Put them on my HK Pro 450 and they work as well as my 25.00 Hitech servos. I will buy more. They can take a hit and go on ticking." "5" "Damian" "May 4, 2011" "Bought 7 pcs for my Trex450 and so far I have no problem yet , they still work perfect as they should with really good price , free shipping , metal gear , strong and fast .... Oh man , I like it" "5" "Michael" "April 5, 2011" "Great little servo, handles being used as a tail servo nicely, fast and strong, ive crashed mine 3 times and had no servo stripping" "5" "eli cortes III" "March 29, 2011" "good servo for the buck. iam using them on my balsa .15 yak-54 and havent had any probs yet. these servos can handel alot. 20 extrem 3d flights and still going strong. a must have for your rc needs." "5" "jetpackninja" "March 15, 2011" "Love 'em. Using these in two of my combat planes. Taken some great hits and even greater crashes. No probs so far and great price." "5" "Steve" "March 13, 2011" "I just put one of these on a losi mini baja (mini-t) and it works really good lots better then stock faster too." "5" "JonWid" "March 1, 2011" "Great for 450 on cyclic. Fast, strong, good centering. Not the best for tail control, expect some bounce." "5" "Jery" "February 22, 2011" "These servos have been great, use them in my boats for throttle and third channels. Very small, high torque and fit any place in the smaller radio boxes. Never a problem with them. No better servo for the price/size/torque." "5" "Lee Thomas" "February 18, 2011" "Awesome deal on this powerful servo. fits snug and works great in my losii mini sct. thanks" "5" "ostiaspedin" "February 16, 2011" "look strong, and if work fine is a great deal" "5" "zat" "February 16, 2011" "these servos are amazingly priced and work great... very reliable" "5" "Chris (4n6Days)" "January 26, 2011" "After using the SG-90 servos on my 450 V2, I decided to go with the MG-90s servos on my EXI 450 PRO. They work great! Noticeably more torque than the SG-90s. I've had one major crash and there were no stripped gears! Definitely recommended!!" "5" "Robert Andrade" "January 5, 2011" "This is a great Little Servo for the price. I disassembled one of them and found it to be as advertised. All metal gears and a ball bearing. With plenty of power and speed. I will by more of these little jewels. Very satisfied. Bob (EE)." "5" "jimcelpaso" "December 15, 2010" "Better price and performance than eRC. I have bought a dozen or so of these and had no failures. Of the survivable crashes, all the salvaged servos continue to work fine. Not so with the eFlite and JR." "5" "bigdogheli" "December 11, 2010" "I use this for my tail servo, WORKS PERFECT! Plenty fast, plenty strong, PLENTY CHEAP!" "5" "scott" "November 27, 2010" "bought 4 or 5 of these had 1 bad 1 but was replaced by hobbypartz. the rest work great. using 4 on my exi-450 no problems after many flights." "5" "Dr. Death" "November 18, 2010" "I have been using these Servos in "ALL" of my Brushless Airplanes. Foam, Balsa, and FunJet. They have been working out "GREAT", I have never had one fail to work. I have one that has been in 3 Crashes, and is still working. I took it apart after a crash to look for any damage. And was surprised to find it also had a BALL Bearing to support the Metal Gears. We tell all our friends to BUY the "PURPLE Servo" for $6.00, and you will be happy with it. Keep up the FREE SHIPPING HobbyPartz." "5" "p Palleija" "November 16, 2010" "I purchased this servos and expected to be somewhat powerfull, but my expectations were large exceeded, it is a great value deal. Also the MG90 (litle larger size) is also a great deal." "5" "John Johnson" "October 6, 2010" "These are awesome for the size and weight. I fly Tricopters and there is only 1 servo onboard, the yaw servo. These aircraft are usually carrying FPV equipment or HD video cameras. I trust these servos on all of my tricopters to handle the workload. The definately help with keep the weight to a minimum, also." "5" "Jim" "September 19, 2010" "Good, quick, and cheap. Handles knocks and bumps while leaving servo intact. Handles crashes much better than the ones with the plastic gear. I've bought several for my 450 helis. Get some." "3" "bart" "September 17, 2010" "Bought 9 of these servos and 2 of them did not work out of the box. I plugged them in the receiver and received no response. Tried them on other receivers and also received no response to transmitter input. So I can't say I love these. The working servos seem to be OK so far but not happy about the non working ones. The price is so cheap not worth sending back." "5" "Jeebs" "September 5, 2010" "Great servo for foamies. I have about 40 flights on them with my foamy and they have withstood hard hits on the runway as well as combat sessions. For the price you can't go wrong. 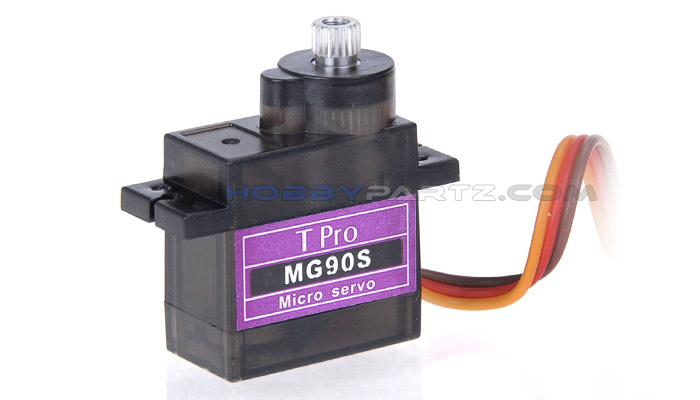 Definitely not an ultra precise servo but again for the price you can't go wrong." "5" "Carlos Gonzalez" "August 31, 2010" "great servos they center OK and the speed and torque are OK for 450 helis and electric plane app. I install 4 in my DW Foamies ASF Juka 48" and they work very well. The only problem I have is I need longer servo horns for 3d but can't find any on the website. Hope somebuddy from hobbypartz will read this and let us know where we can find longer servo horns." "5" "Slo Tom" "August 23, 2010" "Light, strong, smooth and responsive. These are very nice little servos. I have them on a slo-stick for my kids and I'm getting my money's worth." "5" "Mel Roberts" "August 23, 2010" "Hobby Partz delivered promptly, the servos fit nicely and performed beautifully" "5" "Mel" "August 23, 2010" "Worked beautifully and came through promptly" "5" "carl" "July 18, 2010" "great little servos. I use them for the mixture control on my CMB 90 marine motors. I highly recommend them." "5" "Mallory" "February 14, 2010" "I like these servos as my tail servo nice when used with a Detrum GY48V Headlock gyro.Great control on the tail cant wait to see how they perfom in 3D mode." "5" "awesome deal" "January 18, 2010" "I purchased these servos for my EXI 450 and they are working great so far ( 10 flights ). I was reluctant in buying them, but I am very pleased with there performance to date." "4" "carlos" "January 15, 2010" "good little servo fast but does not center 100% of the time,,, i mean it;s off by a nats A** great for what i want to use them for ,,,,,,i recommend them....great for flaps and foamy ,,i will be ordering more"
T-Pro MG90S 9G Metal Gear Servo 1.8kg / 13.4g / 0.10sec33August 8, 2013I have had about 4 of these. They all worked fine, but I have noticed two things about them: 1. Slop in gear train 2. the screws holding the servos together strips out without me touching it, causing the servo to fall apart. I have to CAREFULLY CA them together. Other than that, they work fine. I used them on a giant 60" Foamy Yak on the Ailerons and they worked fine. A little low on torque, I can move the servo arm by hand easily, but all-in-all a good servo.